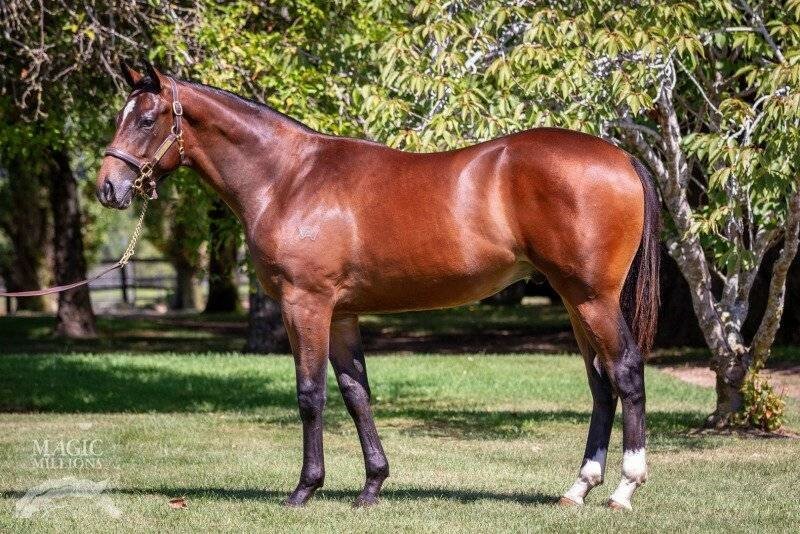 We're excited to have purchased Lot 1 at the 2019 Magic Millions Adelaide Sale- the three-quarter brother to our very own Group 3 winning mare AMMIRATA (Nadeem) and half-brother to stakes place getter and city winner ISLAND MISSILE (Smart Missile). This colt was a must-have purchase for the team after the success of his siblings. "We're not usually active at the Magic Millions Adelaide Sale but this colt was a must-have for us, he ticked all the boxes on pre-sale x-ray/scope and was a real value purchase for us. We've already had several enquiries about him indicating he's going to be extremely popular amongst our client base" Jason Abrahams commented after the sale. Very successful mare Ammirata was purchased by Jason and John (O'Shea) as a yearling and went on to win six races from 17 starts, including 3 Sydney metro races and the Group 3 Belle Of The Turf in 2016, earning her connections over $260,000 in the Red and White Champion silks. His striking sire Scissor Kick is a son of the legendary Redoute's Choice and is from the stallion-producing female family of Danehill’s leading European son Dansili, the sire of over 100 Stakeswinners and 19 Group 1 winners. Group 1 placed, and a two-time Group 3 winner, Scissor Kick is standing alongside some of Australia's best sires at Arrowfield Stud including Snitzel, Not A Single Doubt and of course, Redoute's Choice.